BOSTON, MA -- It was a busy weekend in the Eastern Hockey League Premier (EHLP), with 12 of the 13 teams in action. With a heavy slate of games, there were plenty of worthy honors for this week's awards. 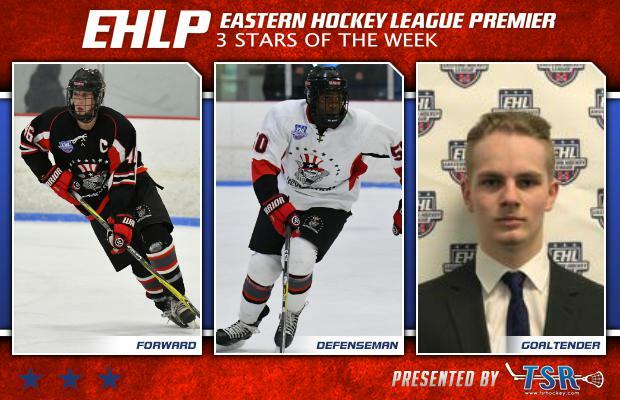 The EHLP is pleased to announce that Nick Giaramita (Philadelphia Revolution), Tracy Robinson (Philadelphia Revolution), and Ondrej Smalec (Jersey Wildcats) have been named the TSR Hockey Stars of the Week. This upcoming weekend includes 11 more games combined on Saturday and Sunday. The next set of TSR Hockey Stars of the Week will be released on Monday, February 5th at 4:00pm. Catch the EHLP action all season long on HockeyTV. Giaramita led the Revolution to a pair of wins this past weekend scoring a goal in his team's 2-1 victory over the New York Applecore on Friday. The '98 forward then recorded an assist in a loss on Saturday, but cam back strong on Sunday, with a seven-point game against the Central Penn Panthers. With the two goals and seven assists for the weekend, the native of Florida continues to lead his team in scoring with 46 points for the year. The Revolution went 2-0-1 this past weekend, beating the Central Penn Panthers 14-3 on Sunday for their 24th win of the season. Tracy Robinson led the way with a five-goal game, earning a hat-trick in the 2nd period alone. The '99 leads all defensemen on his team with 20 goals in 34 games so far this season. The Revolution will get back to work next weekend at home with a game against the Philadelphia Little Flyers on Saturday and another matchup with the Panthers on Sunday. Smalec and the Wildcats won both of their games this past weekend, and the Slovakian native was between the pipes for the overtime victory on Saturday. The '98 netminder stopped 56 shots in his team's 4-3 win over the Philadelphia Revolution, for his first win with his new team. Smalec has a 1-1-0 record and a 4.25 GAA in two games this season for the Wildcats. The squad will get back to work this upcoming weekend with a matchup against the Central Penn Panthers on Saturday, followed by a game with the New Jersey 87s on Sunday. 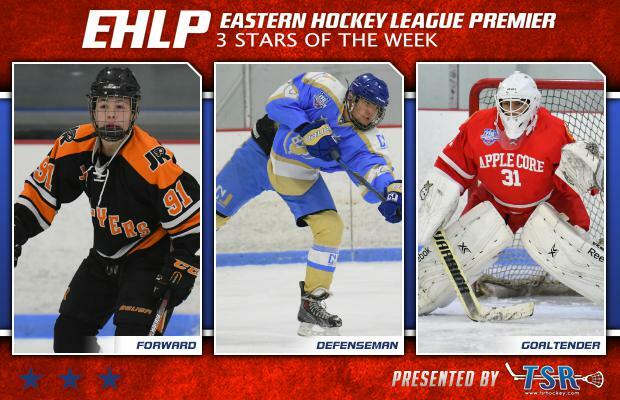 The EHLP would also like to recognize a pair of honorable mentions this week, starting with Jason Sergeant of the Jersey Wildcats. The 2000 recorded a pair of goals in his team's overtime win against the Philadelphia Revolution on Saturday. The native of New York, also posted three points in his team's win over the New Jersey Renegades on Sunday. Kyle Welch and the Boston Jr. Rangers won both of their games this past weekend scoring 18 goals in the process. The '99 forward had a goal in his team's 5-0 win against the New England Wolves on Saturday, then followed it up with a pair of goals and three assists on Sunday, to complete the weekend sweep.